The fox symbolizes smartness and energy with excellent stamina and practical application of wisdom; it is famous for being a spirit animal and also known for their adaptability and perseverance. The usage of ‘fox’ logos in designing can be quite beneficial for designers and also companies or websites dealing in software and designing. The fox is a witty animal which can resemble cerebral energy, and that can be executed in your design. You can get inspiration from these fox logo designs to make your own fox logo or poster. A fox tail is usually very thick and often look like a paintbrush. The fox tail design can be an inspiration for a lot of designing firms, blogs, and websites. The logo can also be used by businesses that sell artwork and paintings. These vector-based designs are downloadable and can be rescaled easily. In specific areas where one needs to display the smartness and wisdom as well as intelligence, this logo can speak out a thousand words by just its appearance. Adaptability is important for sports, so many sports clubs, equipment manufacturers use the fox in their company branding. The green fox logo can be inspirational for any sports equipment manufacturer or an online sports shop. Hence for those areas where one needs to display energy with the help of the logo, this logo is a perfect match. They are known for their agility and speed. So, any kind of logistics business or networking platforms can use fox in their logo. For areas of technology as well as communication, this is a perfectly useful logo. Foxes are popular for their flexibility and tenacity, so it would be perfect if they are used as a logo for a paper manufacturer or an online stationery shop. There are a lot of paper and education related sites that use these logos. The unique logo can be inspirational for lifestyle, apparel, and cosmetic brands. A lot of designers can take inspiration from these small yet elegant creatures. It is also a preferred choice for emerging designers. They are known for speed; the polygonal or geometrical design with sharp edges can symbolize speed. Any kind of automobile manufacturers or accessories manufacturers can use it in their logo designs. One can view these designs on many leading companies that deal in these sectors. A fox is a wise creature, and they also symbolize wisdom and knowledge. The image of the fox with spectacles is quite unique and can be used as a logo for a book shop. A perfectly useful logo for areas where one needs to display intellect. 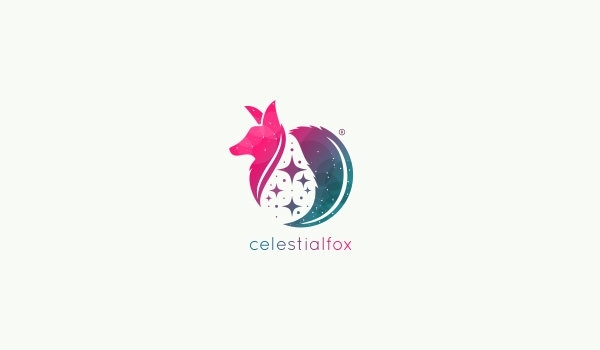 The celestial fox design can be used by any company or business, websites which sell merchandise or equipment related to astronomy. These vector based fox logos are totally free and downloadable. They are inquisitive creatures and using them in your app logo or design can generate interest amongst potential customers. Any app related to education or knowledge can use a fox in their logo designs. Foxes are elegant and creative creatures; any kind of design or photography website or blog can use them in their logo designs. The color of the fox is reddish-grey, which can be used in your designs to make the foreground or logo to pop out against the background. Major IT companies and other law firms can use fox as their logo or emblem. They are known for their vivacity, and that can be made evident in the designs. You can use the fox logo on a sports website, which deals with sporting equipment or goods.